Hello there! You know that once in a while I like to create a special project to join some of my favorite challenges. This time I was motivated by this week’s Mod Squad Challenge: Masculine Birthday. Male cards are possibly the least made, especially in my case because I tend to work with floral and feminine projects all the time. So this was a good challenge for me! 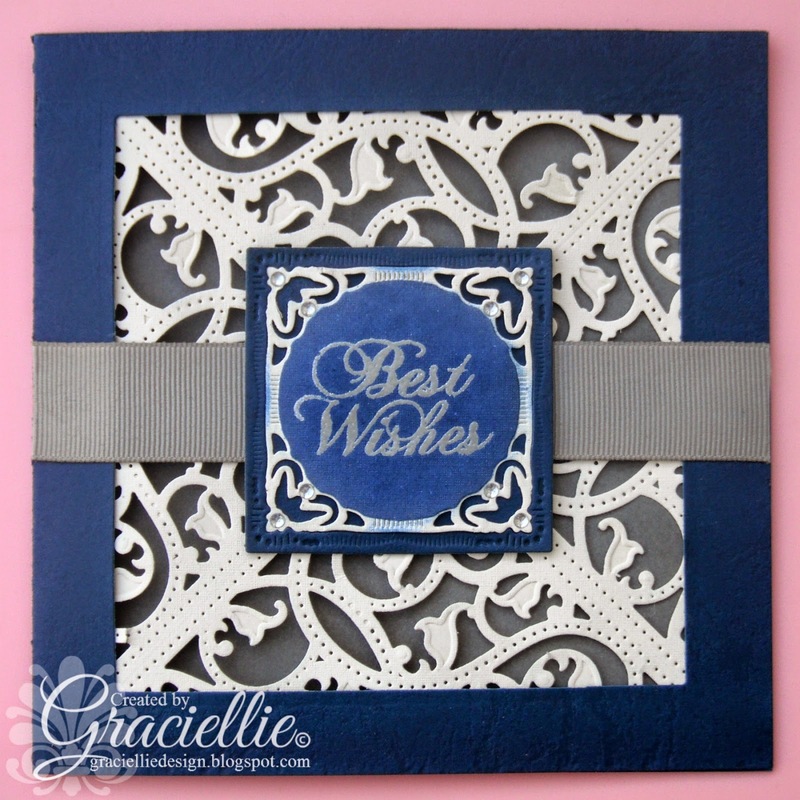 I went for a classy and elegant card in navy blue, beige and gray. This is a 5 1/2″ x 5 1/2″ card with a square window and a filigree background I die cut using Spellbinders Gold Elements One. 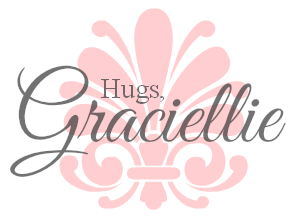 I ran a piece of gray gross grain ribbon across the front of the card, horizontally and added the central labels. 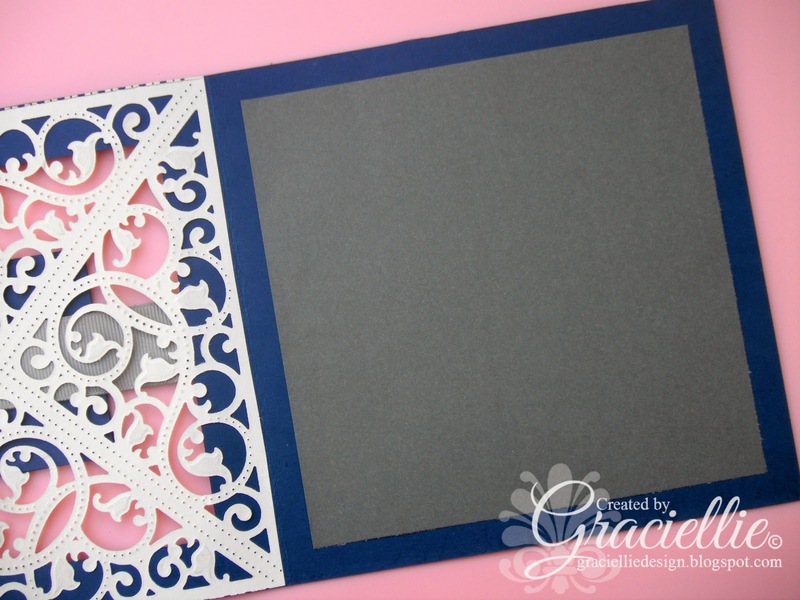 The largerst central label was die cut with Spellbinders Classic Squares Small and Spellbinders Majestic Squares. 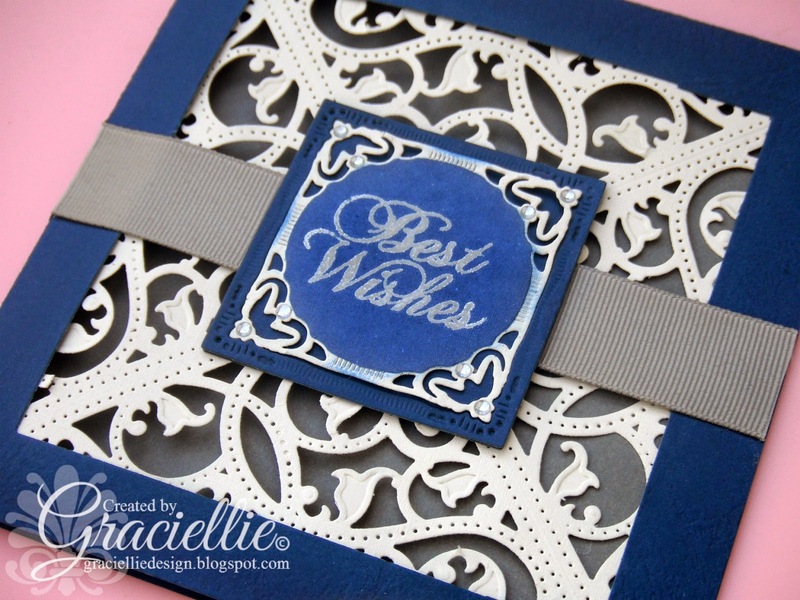 For the smallest central label I heat embossed a sentiment from Inkadinkado’s Personal Impression stamp set in silver and also stenciled it with Memento Ink in Danube Blue. Finally I matted the inside of the card with gray paper and added some crystals to complete the design. I hope you like the card. I had fun making it and I think it resulted in a very elegant male card! Brilliant use of corner dies! Very elegant! Love it! You always do such a great job on your things! It's really great to see a masculine card! You are right — we don't see too many of them! This is wonderful and elegant! Another fantastic job! Beautiful card. You always make such elegant cards! Very Pretty card. I think once in awhile men like a pretty card that is unique. I love the filliagree die background – it really makes this card pop. Thank you for joining us at Perfectly Rustics Masculine Challenge. Such an elegant looking card! Love the colours you have used. Thanks for joining us at Perfectly Rustics.